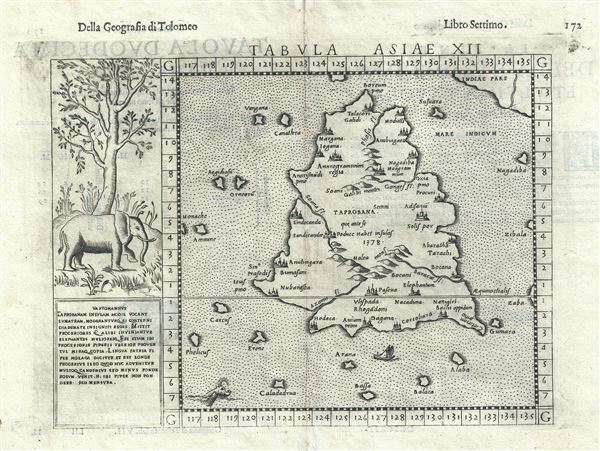 A fine early map of Ceylon depicting an Elephant. It has a circumference of some 2400 miles. And I assure you that it used to be bigger than this. For it was once as much as 3500 miles, as appears in the mariners' charts of this sea. But the north wind blows so strongly in these parts that is has submerged a great part of this island under the sea. This led many early cartographers to over-map the island, exaggerating its size and importance. To give this map some scale, the line running horizontally through the center of this map is the equator, meaning that Ruscelli's Taprobana extends from the southern tip of the subcontinent south well beyond the equator - a factor that would make it nearly as large as India itself! Ruscelli baed this map on Gastaldi's map of 1548. Most variants upon Gastaldi's map feature an elephant to the left of the am proper. This is a rather innovative inclusion, for not only is the elephant present, but is depicted in its natural environment, surrounded by rich foliage. In addition to the elephant, a sea monster appears on the lower left quadrant. This map was first issued in 1561. That plate is recognizable by the fact that the pressmark runs off the plate. A second state corresponding to the current example was issued in 1574. This was an independent plate. A third and final plate was issued in 1599.